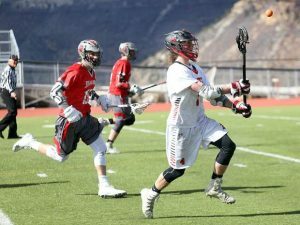 Boys lax: Aspen wins first skirmish with Battle Mtn. Jonathan Wells of Aspen unleashes a shot against Battle Mountain on Wednesday afternoon. Wells scored the second goal in Aspen's 5-3 win. The Skiers earned another home game. 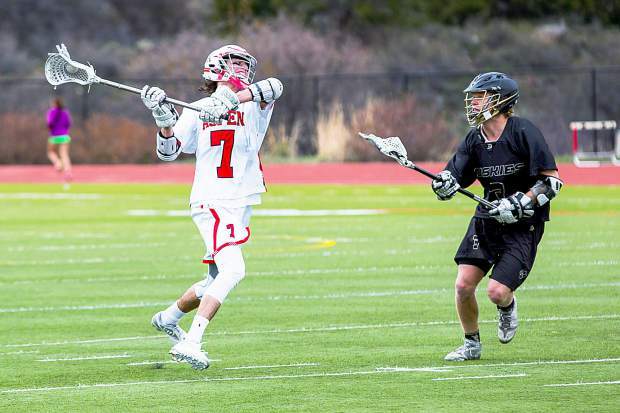 The Aspen High School boys lacrosse team clinched the Western Division of the Mountain League on Wednesday afternoon with a tense 5-3 victory in a rivalry-worthy match against Battle Mountain at Aspen School District Stadium. The Skiers, 10-2 overall and 6-0 in conference, will have the home field for the May 1 conference title game against the winner of the East Division — a possible rematch against Battle Mountain (9-3 overall). He said the Skiers needed clean possessions and ball control against the Huskies in the annual rivalry game. “We were able to keep our composure; we didn’t give them any turnovers,” Goerne said of the game that was penalty-free until the second half. A balanced first quarter saw shots from the Aspen attack and counterattacking shots from the Huskies. Aspen’s Tyler Tick broke the scoreless tie with a spin move and shot with 7:12 to play in the opening 12-minute quarter. That scene would be repeated three more times on a blustery Wednesday afternoon; Tick, who led Class 4A in scoring last year, would finish with four goals in the Aspen victory. Wells’ goal produced the tenuous 2-0 halftime lead after Aspen goalie Artie Kelso turned back multiple scoring chances from John Rulon, Charlie Morrow and Mike Lange of Battle Mountain. The Huskies had two near-goals in the final 20 seconds of the first half, including one shot that glanced off the goal pipe with :07 on the clock. Battle Mountain immediately regained that momentum to open the third quarter, potting two goals for a 2-2 tie — much to the delight of the large contingent of Huskies’ fans who made the afternoon trip to Aspen. Lange, familiar to the Skiers for his play in hockey season, rolled in front of the Aspen goal and scored the first for Battle Mountain just a minute and half into the second half. Cole Delain, after taking a pass from Jeremy Sforzo, tied the game 2-2 with his goal at the 7:54 mark of the third quarter. But the tie would not last. Tick, an AHS senior, scored the go-ahead goal for Aspen with 4:22 remaining in the third quarter. Three minutes later, Tick scored again when Harry Ferguson found him free in front of the goal. Aspen’s final goal came on the first possession of the final quarter after Evan Morris won the midfield draw for the Skiers. The ball went to John Heaphey on a quick attack. He passed ahead to Tick: goal, Aspen leads 5-2. The scoring sequence took 15 seconds. But the resilient Huskies weren’t finished. They pressed the attack and eventually closed with a goal from Morrow, assisted by Lange, with 1:23 to play. 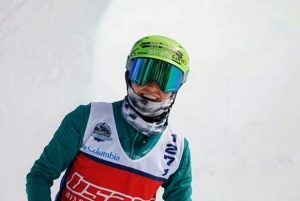 Wells said the Skiers have the ability to pull together in a tense rivalry game like Wednesday’s that matched the high schools from the two resort juggernauts. 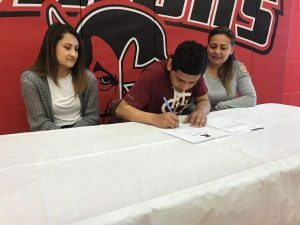 Goerne said that the Mountain League, which has grown in numbers in recent seasons, was split into two different divisions this year with six teams on each side. 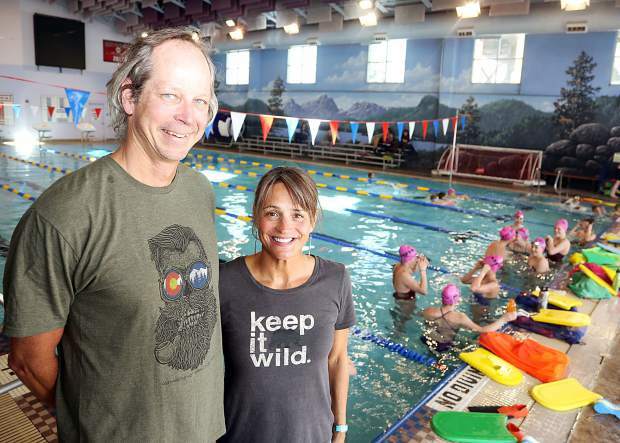 The top two teams in the east and west will play for the league title and state playoff seeding in the last regular-season game May 1 — at Aspen. Battle Mountain will host Steamboat next Wednesday for the top spot in the Eastern Division. 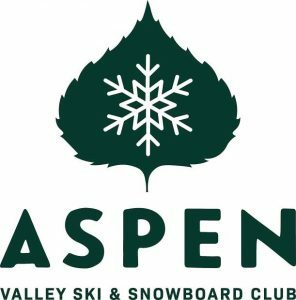 The winner of that game will return to Aspen for the conference championship — and another possible Aspen-Vail showdown. First, the Aspen boys lacrosse team will host Windsor in a nonleague game at 2:15 p.m. Saturday at Aspen School District Stadium. Battle Mountain, with a whopping 17 saves from goalie Mac Schramm on Wednesday, will play at Summit on Saturday before the May 29 home showdown against Steamboat Springs.